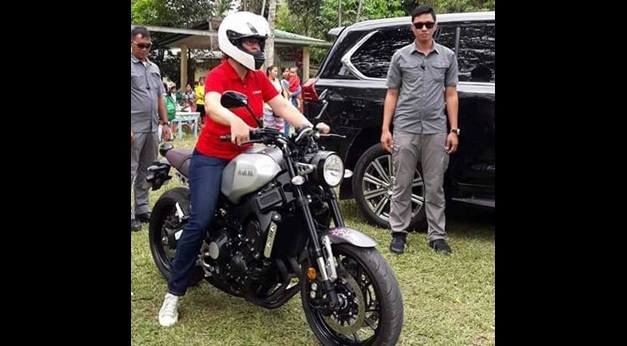 Presidential daughter and Davao City Mayor Sara Duterte-Carpio will be on her big bike as she rides to Tagbilaran City for the Hugpong ng Pagbabago (HnP) rally at the Holy Name University (HNU) Oval on Wednesday. Duterte and her regional party HnP will be campaigning for 13 senatorial candidates which is supportive of the administration of her father President Rodrigo Duterte. She will be on board a boat from Maasin, Leyte to Ubay town. She is expected to be on her big bike as she drives to Tagbilaran. Like the President, Sara is a big bike enthusiast. The Bohol rally is part of the Visayas leg of the HnP campaign sorties that began March 18, 2019 in Catarman followed by Tacloban and Maasin in Leyte on Tuesday. Former Cabinet Secretary and gubernatorial candidate Leoncio “Jun” Evasco Jr. is set to host the rally at 4:30 p.m. to 8:30 p.m. on Wednesday at the HNU Oval. The Alyansang Bol-anon alang sa Kausaban (ABAKA), which is headed by Evasco and an ally of HnP, is among organizers of the HnP rally. Sara is expected to endorse the candidacies of Evasco and his running mate Tommy Abapo. The Davao mayor knew Evasco during the years that he served her father who was then Davao City mayor. Sara is also expected to pitch for the HnP’s 13-member senatorial ticket in the Bohol leg of the group’s campaign. The slate is composed of Senate reelectionists and returnees Sonny Angara, Pia Cayetano, JV Ejercito, Jinggoy Estrada, Koko Pimentel, Bong Revilla and Cynthia Villar. New names in the line-up are former Philippine National Police director Ronald dela Rosa, former Special Assistant to the President Bong Go, Rep. Zajid Mangudadatu (Maguindanao), former reporter Jiggy Manicad, Gov. Imee Marcos, and former MMDA chair Francis Tolentino. It was gathered from ABAKA insiders that dela Rosa, Mangudadatu, Angara, Villar and a representative of Bong Go are arriving in Tagbilaran for the rally.